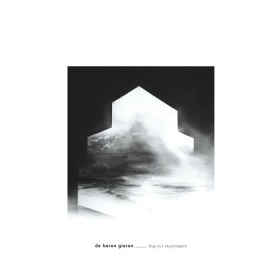 De Beren Gieren - Dug Out Skyscrapers. These days we experience how a series of values and reliabilities taken for granted erode and how reality is gradually shifting to more instability. This Belgian trio took an imaginary far future as point of reference, a future that reconstructs our time as the remote past, a strange and fruitful manoeuvre and maybe a kind of escape into some non-real reality. In those days, a small piece of land existed in the Eastern part of what now is the Great Northern Ocean. It was populated by a lot of nice crazy artists among them a music group calling itself De Beren Gieren. A video document (HERE) was found that shows how different people from those times coped with this mysterious name. In those times language often was ambiguous and the meaning was depended on context. The name was derived from the then well-known expression ‘gieren van het lachen’ meaning ‘shriek with laughter, ‘laugh ones head off’, but ‘gieren’ could also mean ‘detouring’ or ‘desiring’. The three members, pianist Fulco Ottervanger, bassist Lieven van Pée and drummer Simon Segers were not only quite creative and imaginative musicians, inventing desirable and detouring things from found old stuff. They also had a machine that enabled them to post something in a then non-existent future. Thanks to their inventive spirit we now have a better understanding of their time and their music, which wasn’t really understood by many of their contemporaries but because of their great way of performing, it was loved by many. This document with the skyscrapers stems from a time that so-called electronics were very much en vogue. With electronics you could easily expand, distort and pump up sounds such that you sounded bigger, stranger, more mystical, weirder or doomy. But as we already know our three friends were no blind followers of the Zeitgeist but preferred to turn things around in surprising, paradoxical and illuminative ways. They did it here in a way that even now we miraculously can get it immediately. Apparently they could be at two places simultaneously and also chronologically. As we discovered they still operated in the way of the classic jazz piano trio of their past by connecting and uniting heterogeneous musical material and making the song sing itself. It differed through the seeming detours they took that revealed as a real thing. In other words: the staged way of playfully finding was equally important for them as arriving at strong, memorable motifs. These were people who were very inventive (and masterful) in the context they chose. Some distinctive mystery remains as one of the stimuli to become acquainted with De Beren Gieren's serious way of having fun.